Cocoa covered almonds, toasted coconut flakes, and International Delight Iced Coffee Mocha Light, makes this Choco Coconut Mocha Ice Cream the perfect afternoon pick-me-up that reminds you of one of your favorite candy bars! Have you ever noticed how rough afternoons can be? After working from home all day, homeschooling a 5th grader, taking the dogs in and out to the bathroom, and cleaning house or doing laundry all day long, I am exhausted. For a coffee drinker like myself that is where I would grab a big cup of coffee, and call it a day. However, when it’s 90+ degrees outside, which believe it or not, here in Florida, that is not unheard of in October, who wants hot coffee? I do not. Well, at least not all the time. Sometimes I’d rather just grab a snack, than a cup of coffee, since dinner can still be hours away. Remember, I’m the mom, I have to cook the dinner too, even after being teacher/wife/CEO/mom all day everyday. But, I really need that afternoon pick me up that my coffee addiction seems to give me. I normally can’t have both because coffee suppresses my appetite. That is where my Choco Coconut Mocha Ice Cream comes in. You can have your coffee and eat it too! When I discovered International Delight Iced Coffee’s I was so excited, because like I mentioned who wants coffee when it’s 90+ degrees outside? International Delight Iced Coffee comes in a variety of flavors from my favorite, Mocha Light or Mocha, that I use to make my Choco Coconut Mocha Ice Cream, to Caramel Macchiato, and Vanilla. When it comes to creativity the possibilities are endless. I have had a crazy craving for ice cream lately, but the only thing that I wanted, I couldn’t seem to find. I pulled out a recipe that I used to use from time to time, and it was the perfect thing to cure my sweet tooth, and my coffee addiction! When I was picking up my heavy whipping cream for my recipe, I grabbed the International Delight Iced Coffee Mocha Light (since I’m watching those calories). Thankfully you don’t have to wander far from the whipping cream, because International Delight Iced Coffee is so conveniently located right there in the refrigerated tea/juice section at Walmart. I’m not sure how your Walmart is laid out, but all of our tea, juice, milk, creamers, and iced coffees are right together. Which also makes it easy to grab when your picking up milk for your kids! You never have to be without your iced coffee! Now, let me show you how simple it is to make this Choco Coconut Mocha Ice Cream with only 5 ingredients! Start by pouring your sweetened condensed milk and International Delight Iced Coffee Mocha light into a bowl, and stir to combine. 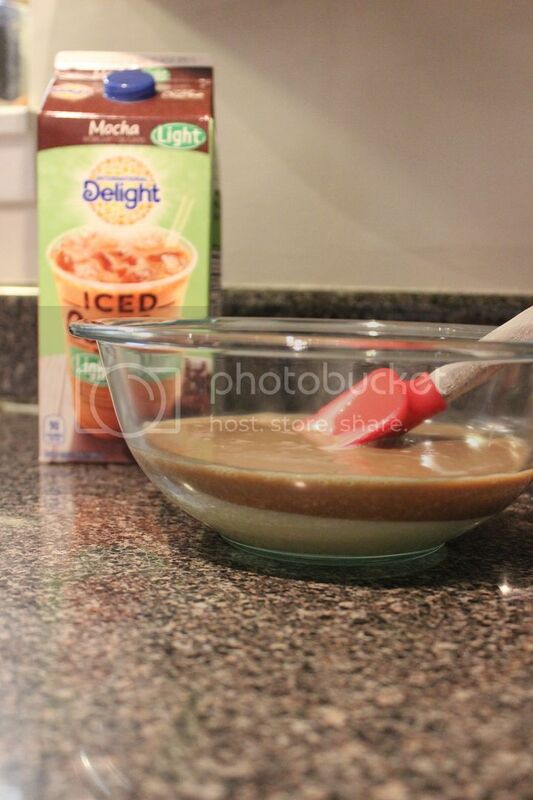 Pour your heavy whipping cream into a large bowl, and stir in your International Delight Iced Coffee Mocha Light/sweetened condensed milk mix. Place in the freezer for 20 minutes to get it nice and cold. Then pour in your chopped cocoa almonds. I only use my ice cream maker to get my ice cream colder to freeze faster (I’m impatient), like I mentioned above you can skip that step. After it’s in the ice cream maker, you can serve it up from there, or pour into your freezer safe container and freeze for only 2 hours to achieve a more solid ice cream. Once it’s frozen to your desired consistency, it’s time to serve up your coffee in a new way! Enjoy a nice bowl of Choco Coconut Mocha Ice Cream! How do you enjoy your coffee? What fun and creative ways have you tried? Need some coffee inspiration? Check out all the great ideas at International Delight! Start by stirring together your iced coffee and condensed milk. 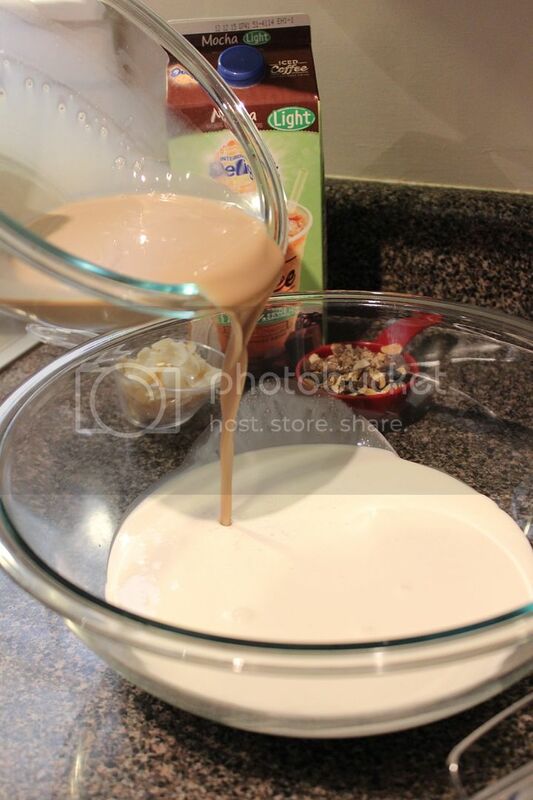 Next pour your heavy whipping cream into a large bowl, and stir in your iced coffee/condensed milk mixture. 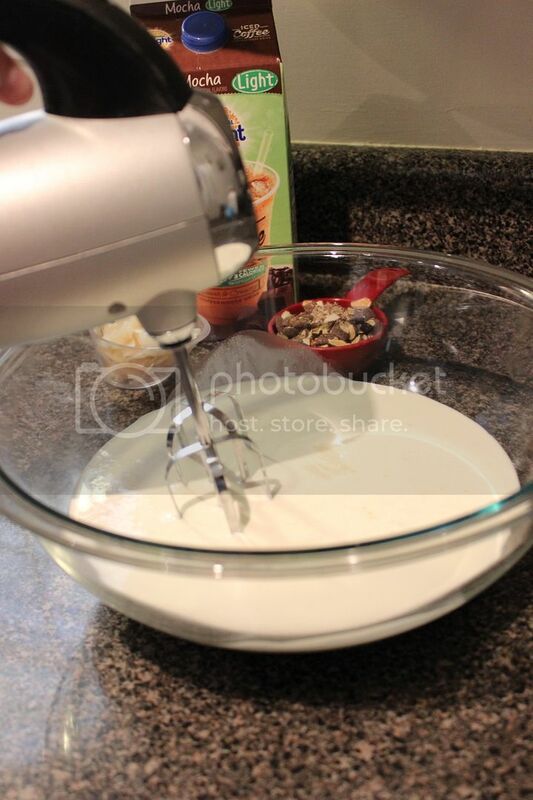 Using a mixer, mix until you have a slightly thickened and foamy consistency. After 20 minutes pour into an ice cream maker. Pour in your chopped cocoa covered almonds and toasted coconut. 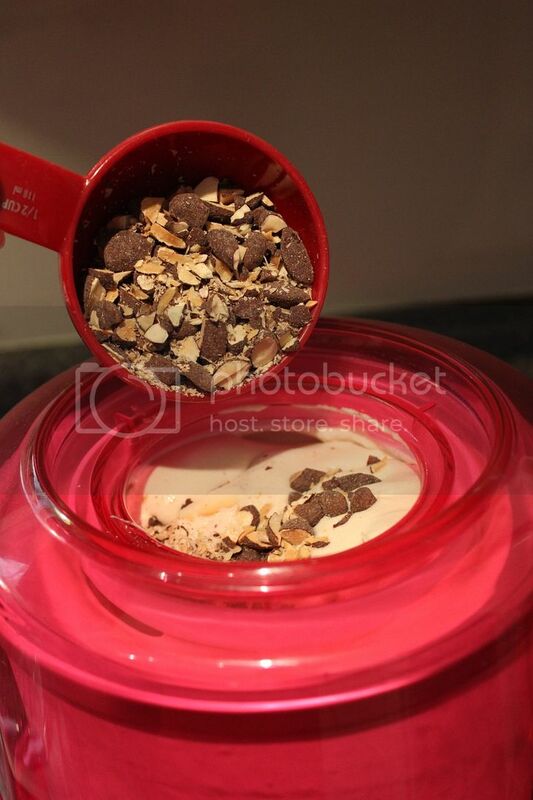 Continue in your ice cream maker until you reach desired consistency. 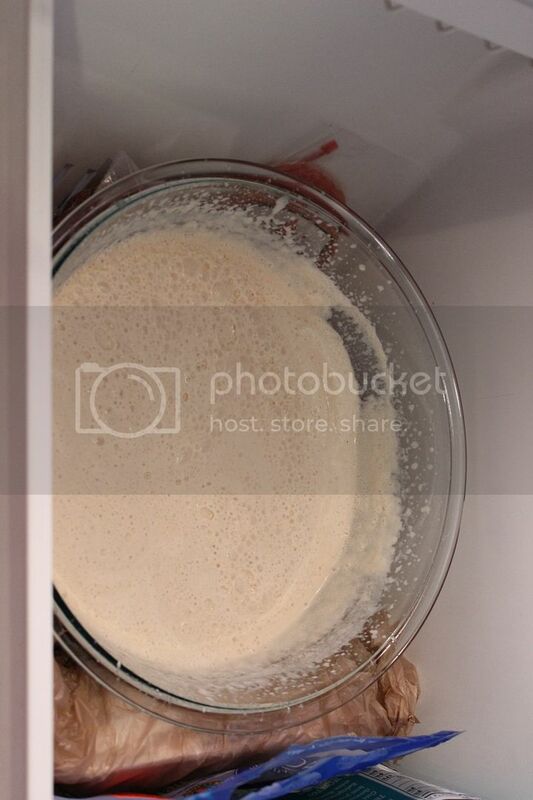 If you want a more solid ice cream, pour into a freezer safe container, and freeze for 2 hours. 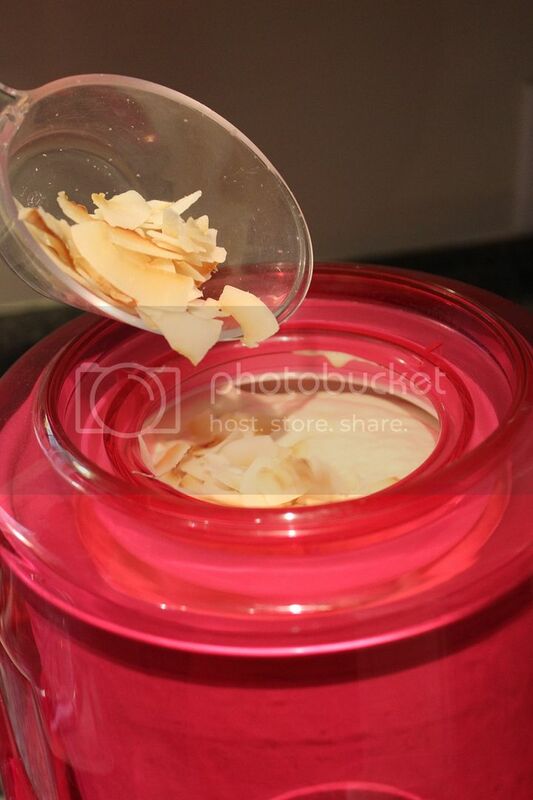 If you do not have an ice cream maker, you can skip that step, and mix in your almonds and coconut, and freeze for at least 6 hours. Oooh, this looks so good. I definitely eat ice cream all winter, haha, I won’t let that stop me! I’ll have to make this, uum! Yum. Seriously. It could be very dangerous that this ice cream has so many of my favorite foods, all in one tidy package. Good thing my ice cream canister is on perma-chill in the freezer at all times. 🙂 Thank you for sharing! Stopping by from Good Tips Tuesday! I have some of this iced coffee in my fridge right now. The exact same flavor. I could be enjoying this ice cream tonight…thanks for sharing! I’d love to know if you made this Abby, and how you liked it? Thank you for linking up to this week’s Tasty Tuesday. I have pinned your recipe to the Creative K Tasty Tuesday Pinterest board. I hope that you’ll join us again next week! Oh Wow, this looks amazingly delicious! All my favorite flavors! Thank you for sharing at Oh My Heartsie Girls WW! It would be a pleasure to see you next week! Enjoy your weekend!